It’s clear to anyone with a pulse that this season hasn’t gone well for the Ottawa Senators. As of press time, the club currently sits fifth in the Atlantic Division. 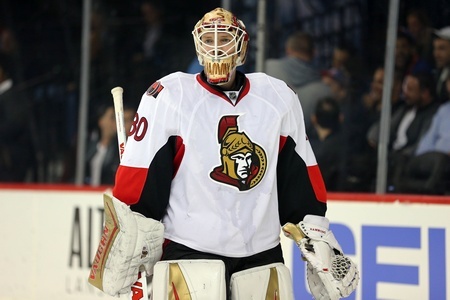 Back in December, we talked about how the Senators were in need of their Christmas break. They were 17-12-6 at the time, good for fifth in the Atlantic Division, and they had 105 goals. Very little has changed since then. Sure, they went out and got Dion Phaneuf from the Toronto Maple Leafs. As was widely reported, Senators owner Eugene Melnyk went on a bit of a tear on Tuesday. He noted that there would be changes in the off-season and said that nobody on the roster or coaching staff was safe. He blasted coach Dave Cameron, stating that his decision to start Matt O’Connor in the home opener way back in October was “stupidity” and laid claim to the belief that the team should be in the top five. Of course, Melnyk’s always been the optimistic sort. Most owners are. Most owners think their hobby projects are winners, even if they can’t see the writing on the wall. Cameron, long accused of being a horrible coach by many in the Ottawa fanbase, has had to manage expectations since Day One. But what about the pieces? Beyond Erik Karlsson, the Senators have very little to work with. They nabbed Phaneuf, but they sit 22nd in payroll in the National Hockey League and have very little to show for themselves in terms of hockey operations. They haven’t drafted particularly well in recent years and have struggled when it comes to ingenuity. The Senators have taken chances on players like Bobby Ryan, who was signed to a seven-year extension ahead of last season, and have crossed their fingers. That’s not going to work in today’s NHL if you don’t have a little luck along the way. The Senators have still scored goals, as has been the trend, but they’ve been virtually porous at the other end of the ice. It doesn’t seem to matter who gets the nod in goal, whether it’s the “stupidity” of starting a backup or the decent thing of going with Craig Anderson. While last season saw this team close up shop with a flurry of wins on the back of an amazing run by goalie Andrew Hammond and some serious goal-scoring by Mark Stone, that all came crashing down when they met the Montreal Canadiens in the post-season. And as much as many fans hate to admit it, luck and intangibles had a lot to do with that sublime conclusion.